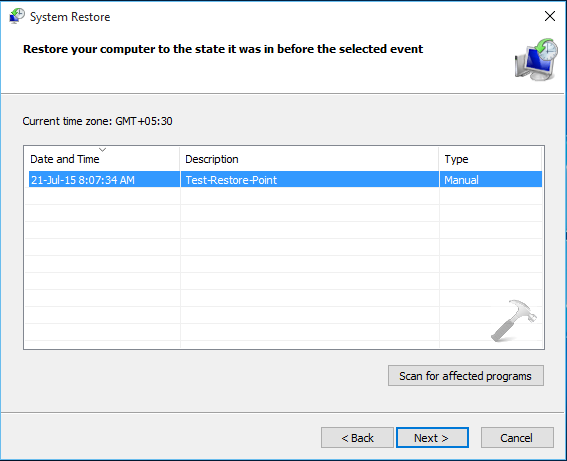 System Restore aka last known good configuration has played crucial role in troubleshooting Windows related issues on various editions. Basically, when a system restore point is created, system saves the image of Windows OS at the moment and when you try to restore, the image is restored actually. In our articles, sometimes we have to follow the registry manipulation. Since serious issues may occur if we make mistakes in registry, hence we always recommend users to create system restore point before modifying registry. This recovery feature is most helpful when you’re going to install third-party software on your system, so that if something goes wrong, restore may help. However, Windows automatically create System Restore point, time-to-time, provided if System Protection is on your system. 1. Press + R and type rstrui in the Run dialog box, click OK or press Enter key. 2. In the System Restore window open next, you’ll see the message that No restore points have been created on your computer’s system drive. To create a restore point open System Protection. Hence click on system protection link there. See this if System Restore is disabled by your system administrator. 3. Now in the System Properties window, select your system root drive under Protection Settings heading. Then click on Configure button. Please note that atm the System Restore and Create button here are greyed out. 4. In the System Protection window for selected drive, select Turn on System Protection option. Click Apply followed by OK. In this way, we have configured System Protection which in turn let system to create restore points automatically. You’ll observe that the greyed buttons in window shown in step 3 also becomes active. Now let’s see how to create a restore point manually. Read : Windows not creating System Restore point automatically. 1. Click on the Create button in System Properties window shown in step 3 of PART 1. Then give a name to the restore point which you’re creating now and click Create. We recommend you to use such name, we will help you to easily recognize the restore point later. 2. In few moments, you’ll receive The restore point was created successfully message. Click Close. 1. Click on the Create button in System Properties window shown in step 3. Then in the System Restore window shown below, click Next. Notice that it’s the same window, we got in step 2 of PART 1, but now there is no error message as we created a restore point. 2. Moving on, identify the restore point which you want to reinstate and click Next. 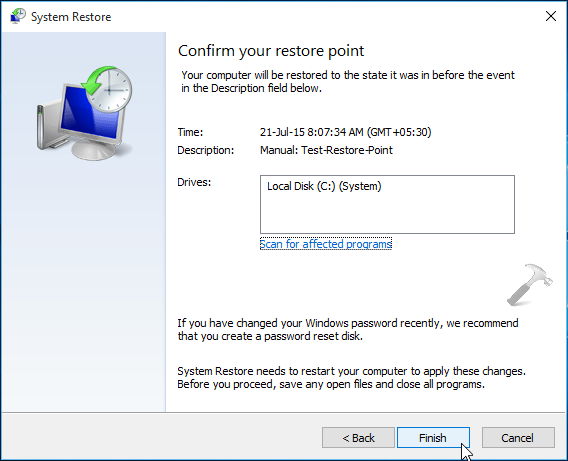 If the restore point you select here is Automatic, you can click on Scan for affected programs button to verify why Windows created that point. 3. Next, confirm your restore point details and click Finish. 5. You’ll now see that system prepares for restoring and then restarts itself. Past reboot, the following screen will appear to show the progress of restore operation. Checkout this if you get System Restore did not completed successfully error. 6. Finally, when restoration completed, you can log in to your system. This confirmation you receive shows the success of restoration. Click Close. Hope you find the guide useful! Now learn how to create system restore point using Desktop right click context menu. ^^ Glad you find it useful! getting the same error “the extended attributes are inconsistent” while running the rstrui through cmd.